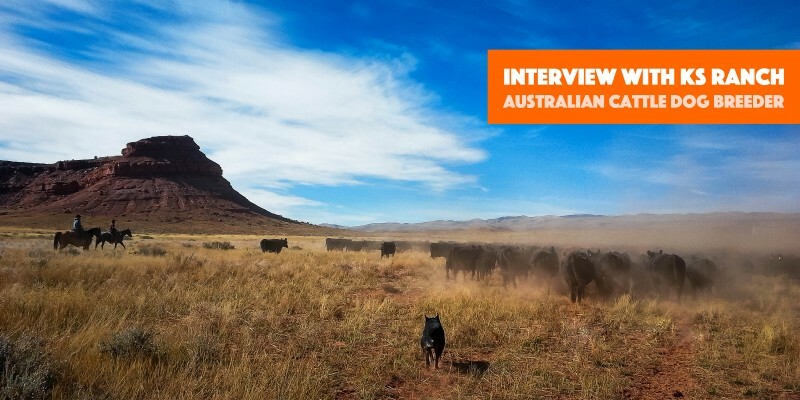 A new interview, this time with Gwen Shepperson from Buffalo Creek Ranch Cattle Dogs (formerly KS Ranch) who breeds Australian Cattle Dogs. The kennel is actually (an surprisingly) not a kennel. Gwen and her family run 2500 heads of Angus beef cattle on over 100,000 acres in central Wyoming, near the southern Big Horn Mountains. They need working dogs that can handle the tough job of dealing with cattle in a rugged environment so they started breeding their own Australian Cattle Dog litters and kept the puppies to train them and kept on going. Their dogs are now sought after by the neighboring ranches and farms, but Gwen still breeds cautiously, to make sure the quality stays and improves. Let’s dive into this great interview! How did you get introduced to the Australian Cattle Dog and why did you decide to breed them? My name is Gwen Shepperson, I was introduced to the Australian Cattle Dog working on various ranches in the Western US. When I got married, my husband’s family had always had some breed of working dog on their cattle ranch, and I was given a litter of Australian Cattle Dog puppies as a wedding gift from my brother in law. The rest, as they say, is history! We are a remote cattle ranch in central Wyoming, we raise a commercial herd of Angus cattle on over 100,000 acres of rangeland that is rough and rugged. 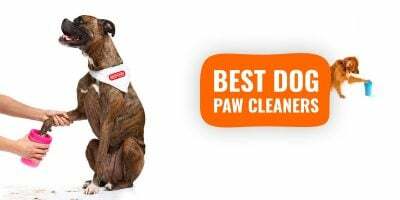 Our dogs are our “hired hands”–we do not employ any outside help. It is not uncommon for the dogs to move several hundred cow/calf pairs at a time, trailing many miles in a day. They work all classes of cattle from newborn baby calves to bulls that weigh over a ton, on all types of range, in all types of weather. We demand a lot of our dogs as a working partner, and the Australian Cattle Dog is the best breed that suits our needs. I began breeding mostly to keep us supplied with good working dogs, but when others needed the same kind of dog as well, I began selling them to others–mostly neighboring ranchers and farmers. Then someone would see their dogs work, and would want one, and contact me wondering when the next litter was due. I was very fortunate to have good useful dogs that helped others with their needs as well as my own, and it has just kept progressing from there–we now have dogs all over the world. What makes Australian Cattle Dogs different from other herding dogs such as the Australian Sheepdog or the famous Border Collie? I think the Australian Cattle Dog has more mental stamina on the whole, and their working style is much different as well. They combine eye and pressure with the ability to use bite to back up other methods when livestock needs more force to be moved. 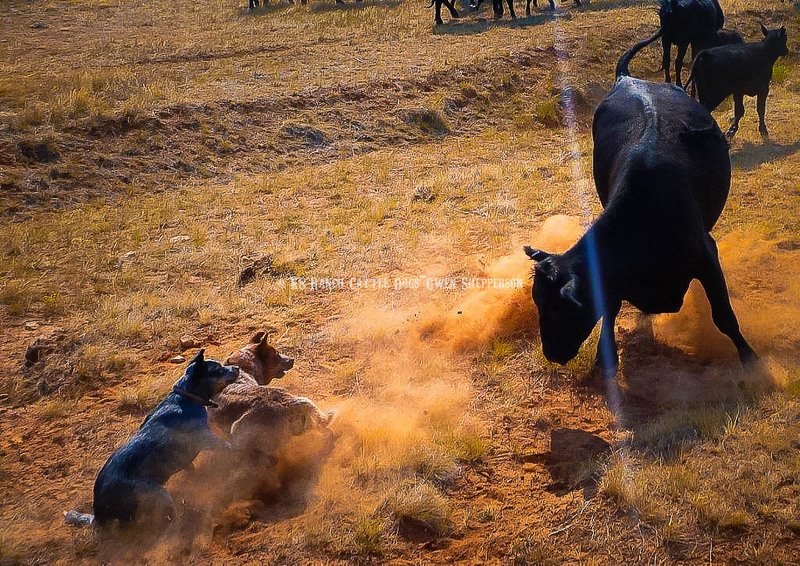 We have had other breeds such as the ones mentioned above, and they were just not enough “dog” for the job–we are very demanding of our dogs with over 100,000 acres of very rough rangeland and hundreds of cattle on that range. 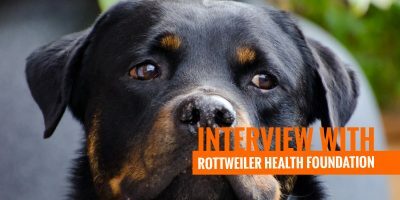 What are the medical conditions found the most in the breed and are there any health screening available? PRA, PRCD4 (Progressive Retinal Atrophy) and Primary Lens Luxation are eye issues that Australian Cattle Dogs should be tested for, all dogs should be evaluated for Hip, Elbow and Patella Dysplasia, and have a BAER hearing test to check for deafness/unilateral hearing. 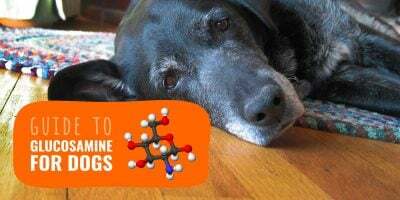 As a working breed, it is inherent that breeders use these tests to continue to produce dogs that are healthy for their lives in order to be a useful working partner for their owners, along with a beloved family companion too. 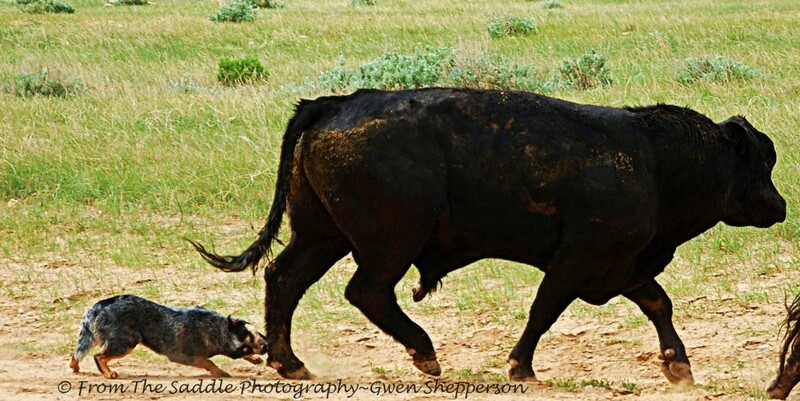 Harper, Gwen’s Australian Cattle Dog, working on a big scary bull. 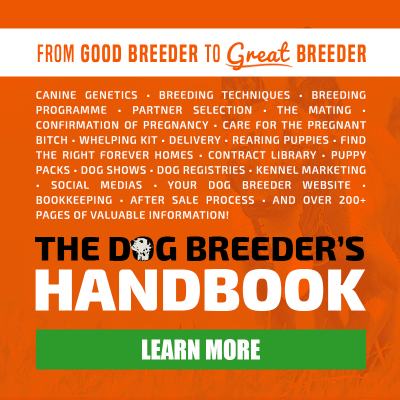 Tell us more about your dog breeding programme, do you inbreed and linebreed or do you prefer outcrossing to bring external blood into your lines? As we are a working cattle ranch first and foremost, I concentrate primarily on the working breed standard, along with the correct physical structure that will allow a dog to have the conformation to be a durable and useful dog, and the temperament to enjoy a hard days work or life as a family companion. I strive to produce puppies that are structurally sound and balanced with eager, trainable minds that have the tough drive and natural ability to work stock, be terrific companions, competitive performance dogs or conformation show prospects. 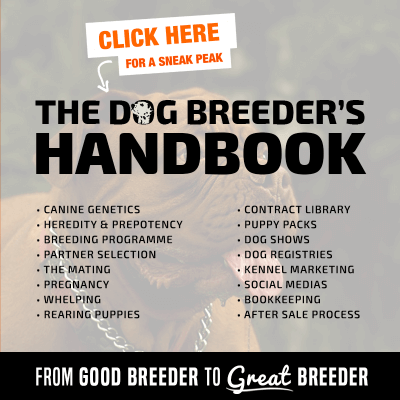 I use bloodlines and pedigrees of dogs that support my needs for a working dog, and that will produce a correct dog both physically and mentally–I have done both closer line breedings, as well as total outcrosses. Which traits do you place the most emphasis on in your breeding programme? Which traits have been the most difficult to alter? The focus is on a correct physical structure, temperament and natural ability to work. I think color genetics can be very difficult to correct. Just as the temperaments of dogs that tend to be not as self assured and confident as we need in a working dog, so I tend to stay away from dogs with a more mild temperaments. However, our dogs are our beloved family companions along with our working partners, so it’s important to me to have dogs that are focused and determined when working, but also easy to be around and enjoyable companions when we are not working–good with people, especially kids, and dogs that have an “off” switch and can handle everyday life when it does not include working livestock. What should Aussie Cattle Dog breeders do in order to improve the breed, as a whole. What is the direction the breed is taking and how do you see it perhaps 30 to 50 years from now? I think with the disappearance of large working livestock ranches and farms over the years, the working ability of the breed has suffered, since most people do not need that ability of the dog in their daily lives. You are also seeing a smaller sized/boned Aussie Cattle Dog, especially in the conformation venues, and for a working dog, that physical structure is not going to be durable or possess enough endurance for those of us that still need the ACD as a working partner. Luckily, there are also many breeders who are dedicated to preserving the original intent of the breed standard, both working and physical, so I hope the Aussie Cattle Dog continues to keep to that standard over the coming years. With extreme breeding and the demand for very small breeds, hybrid dogs, and so on, how is the demand going for purebred Australian Cattle Dogs? Have you seen the number of breeders growing or declining over the years? 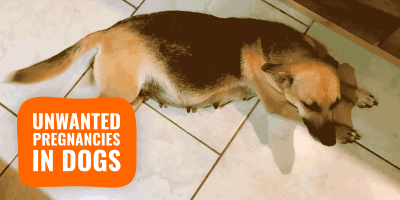 Unfortunately, there are those “breeders” who have attempted to include the Aussie Cattle Dog in this trend, breeding strictly for a smaller size, by either using the “runts” of the litters for breeding stock, or crossing them with smaller toy breeds. There are also those that breed strictly for color faults that are “rare”, such as white, chocolate or sable–all of which are serious color faults, but some see it as a way to increase a sale price since they are unique. 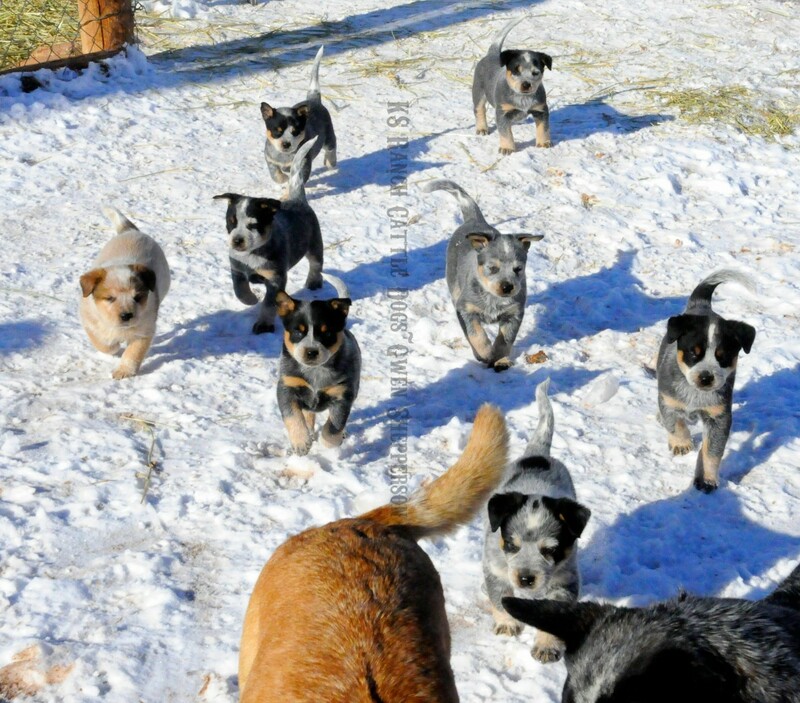 How cute are these Australian Cattle Dog puppies from Buffalo Creek Ranch Cattle Dogs? I think when “breeders” start trying to produce dogs that concentrate on one trait only, the overall quality of the breed will sadly suffer. 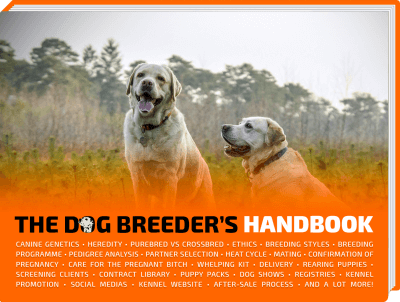 And, most of these “breeders” are not breeders at all–they are merely people producing puppies that will make them the most money by catering to current trends, not Breeders who are health testing and carefully breeding to produce healthy, useful, trainable dogs. Do you attend trials and dog shows in order to grow your reputation, and perhaps network with other breeders or owners? Many breeders find their studs for future breedings that way. With a large remote cattle ranch (we are 80 miles from town and 45 miles from school) to run with my husband, I do not have time to travel to trials and shows–although I would love to someday. I am lucky that many of my puppy buyers are active with our dogs in these venues, so we have bred dogs that are conformation champions, herding trial title holders, performance title holders, World Champion disc dogs and successful in many other venues as well. Our dogs are our “hired hands” here on the ranch, it is myself, my husband, our two children (13 and 15) and the dogs that do all the cattle work on our ranch of over 100,000 acres, and we often help neighboring ranchers as well. I have been very fortunate to forge some great relationships with other Australian Cattle Dog breeders over the years that have allowed me to improve my dogs with other bloodlines, as well as opportunities for our dogs to be included in other breeding programs. Tell us about your future champions and promising litters you have in mind – whether they are coming soon or still being prepared? All dogs I personally own are my personal working dogs; they learn to work from a very young age and are exposed to cattle when they are still a small puppy. My youngest dog is a blue female, Marin, who is just over a year old and has been working cattle since she was 10 weeks old. I have two litters planned next year that I plan to keep a pup out of myself–I tend to only breed when I need another dog personally. We also have a few dogs owned by others that are doing some herding trial and conformation venue work–and I am looking forward to seeing their successes as well. Axl & CeCe caught in the action on Buffalo Creek Ranch’s land. What advice would you give someone just starting a breeding program besides reading a lot and learning? What do you feel are the most common mistakes newcomers make? Do not be in a hurry to produce puppies–quantity is NOT the same as quality! Just because you can put Dog A with Dog B and get puppies does not mean that those dogs are breeding quality that will produce breed standard quality puppies that will better the breed. 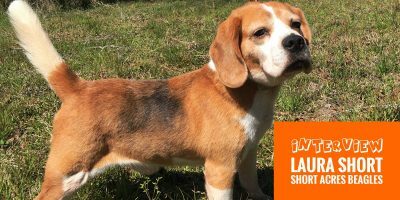 There are no perfect dogs, or perfect crosses, but a significant amount of research and consideration should be taken before a litter is produced. Health testing on all dogs before breedings occur is essential to keep our breed as free from genetic issues as possible. Lastly, what is your most memorable client and sale, and why? There have been many–some fantastic experiences and other that have been “learning” experiences too. My favorite puppy owners are those that keep in touch, send me pictures and updates and keep busy with their dogs–even if it is not working livestock. Does Bossy want to work? How is she with other dogs/animals? Where are you? I am in Idaho.